Like most areas bordering busy stations, the food and drink options in London Bridge are a mixed bag — less village-like than Bermondsey to the west, more aimed at the City crowd than nearby Borough Market. But jostling up to all the steel-and-glass offices there are some great independents, reliable chains and neighbourhood pubs. My Tea Shop - also does coffee. My Tea Shop is open from 6.30am on weekdays, serving up fried breakfasts in a tiny, unassuming space under one of the railway arches along Duke Street. Café Rossi on Borough High Street also offers fry-ups from 6am on weekdays — and maybe thanks to its Italian owners, it serves better coffee than most of the early-opening caffs in the area. A no brainer for breakfast (if you fancy devouring huevos rancheros among Pat Butcher memorabilia and a somewhat gimmicky All American diner vibe), is The Breakfast Club. Head towards the Thames for another early morning favourite, Bill's, which carries a farm shop chic vibe and a decent selection of veggie offerings. The Filthy Animal at Patty & Bun. 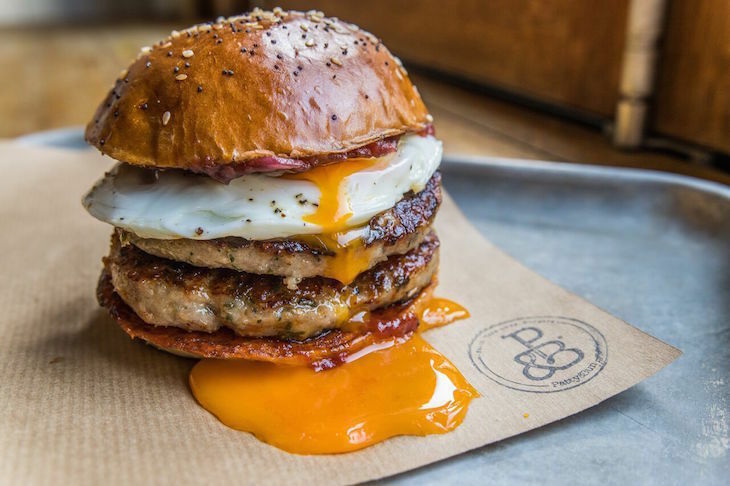 If you're still attempting recovery from a somewhat heavy night, we suggest swooping by Patty & Bun and devouring (at least) one of the breakfast burgers. If you've got time, linger over your food in the dark, calming downstairs basement. B Street Deli does soup, freshly-made sandwiches and — the main attraction for a lot of customers — artisan flat whites from London roastery Volcano Coffee. A few doors away there’s lunchtime competition from eaTalia, offering rigatoni bolognese and lasagna, among other pasta and vegetable dishes. Most come in at less than £5. Though both have space to eat in, get your food to takeaway when the weather's decent and head to Leathermarket Gardens across the road for a park lunch. 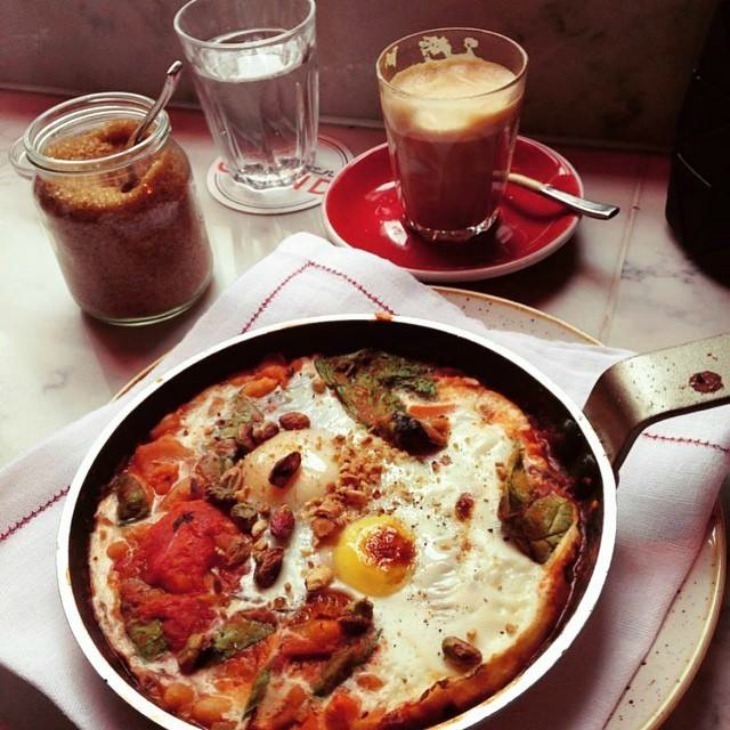 While primarily known as an espresso bar (and therefore housed in the coffee shops section below), London Grind does serve up food throughout the day, including some mean chorizo and smoked cheese croquettes. Next to Borough Market entrance, Brindisa is a bustling, no-reservation tapas joint, with enough tables to make it a feasible lunch break stop off. Needless to say, the renowned Borough Market with its endless artisan food stalls, fresh produce and restaurant pop-ups is a popular, albeit pricey, option. London Grind has the artisan coffee and cocktails of its more established Shoreditch branch (with other branches dotted around London), as well as a full restaurant menu for the crowds taking advantage of the sunrise through to midnight (or 1am on Fridays and Saturdays) opening times. The delicately-named Fuckoffee (from the Jonestown branch of coffee shops) also does organic and single source coffee, along with enough sandwiches, cakes and sinking sofas to make it worth getting your espresso to stay. 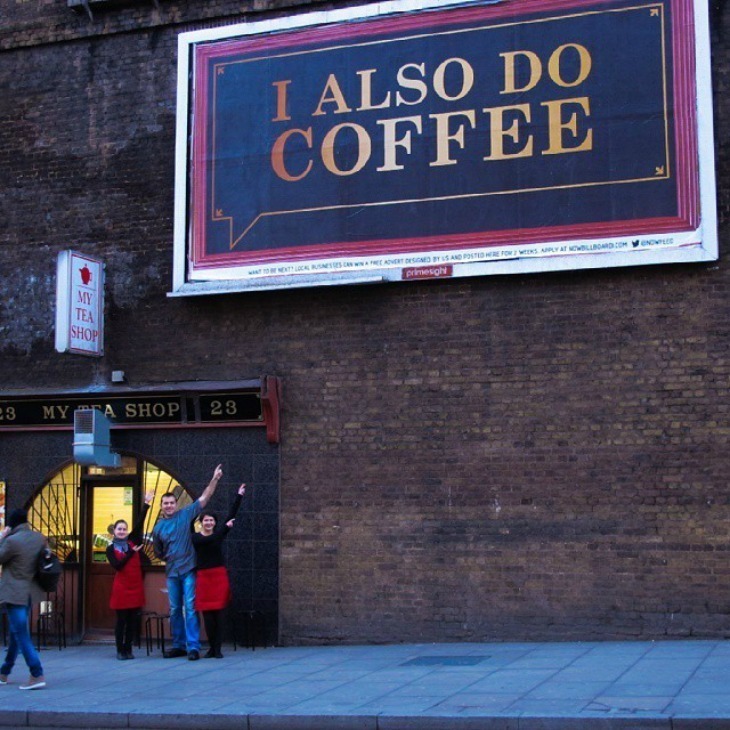 Under one of London Bridge station's covered walkways, Three Wheels Coffee is in permanent residence after previously roaming around town on, you guessed it, a three wheeled bike. A welcome addition for a reliably high quality flat white. London Bridge isn't short of wine bars and cocktail joints for the after-work crowd. Jamie’s Bar (also known as London Bridge Pub and Bar) and Heeltap are popular on weekday evenings. On the pub side of things The King’s Arms and The Leather Exchange both have a good range of cask ale. Visit The George or Bunch of Grapes for craft beer by the can — the former is famous for being the only galleried coaching inn still standing in London, while the latter boasts a sunny terrace out the back. But if burgers are just as urgent as beers, Bunsmiths — in charge of the food at The Miller — do the best in the area. The garden at The Woolpack. 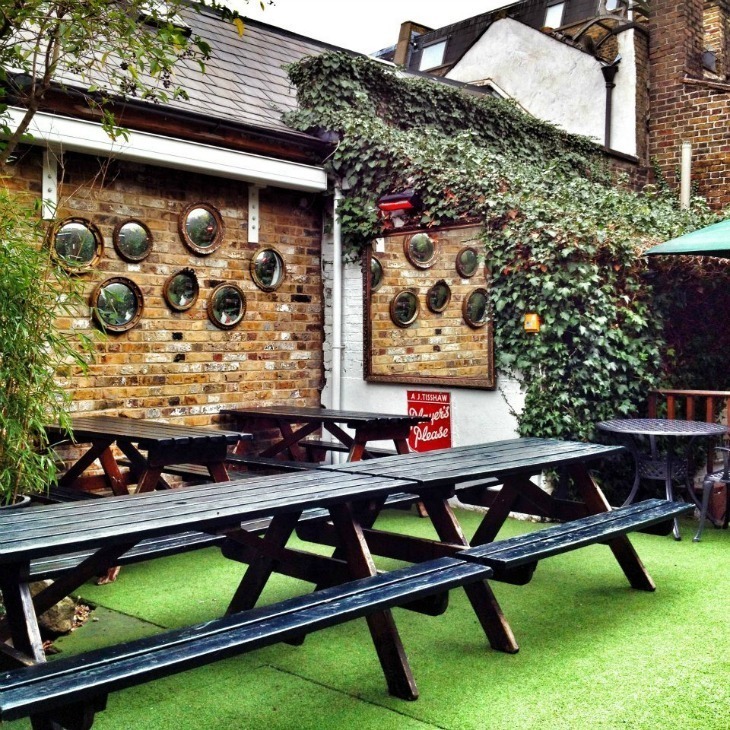 For outside space The Woolpack is head and shoulders above the rest in the area — less for size than for how secluded the small beer garden feels despite being in the middle of busy Bermondsey Street. Just down the street there's The Garrison which sits firmly on the restaurant side of the gastropub spectrum — all sleek and glossy, with banquette seating and a wide variety of menus incorporating dishes like confit rabbit leg and poached salmon. Or choose between cheeseboards and full-on steak dinners at the Mug House, to be devoured in their Dickensian-style surroundings under one of London Bridge's archways. Vivat Bacchus in London Bridge — younger sister of the busy Farringdon restaurant — has regular wine tastings and South African specialities. Biltong and kangaroo steaks are on the menu, as well as more standard gastropub fare. There's even a vegan menu. If you like a more American hit to your smoked meat, the brisket, shortrib and chicken thighs at Texas Joe's should have you sorted, everything coming with a side of pickles and bread. Bacon-wrapped stuffed jalapenos and bone marrow are optional extras. 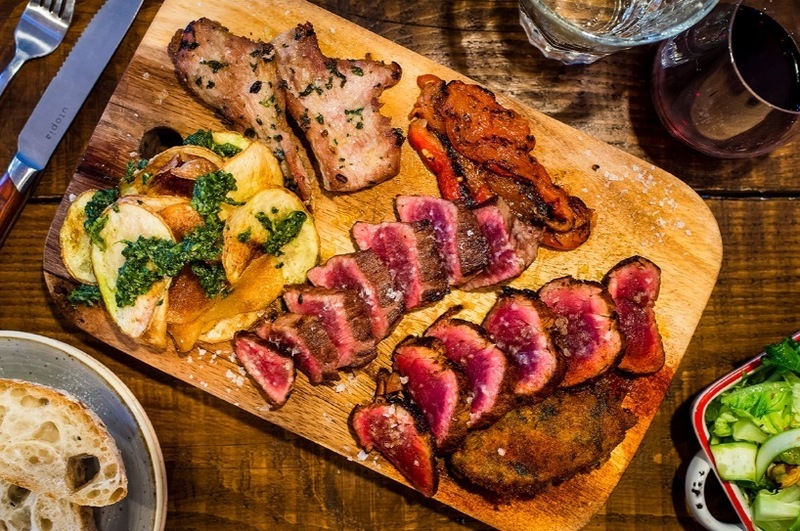 The area's strong on Spanish and Latin American influences — try Lobos Meat and Tapas for exactly what it says on the tin. 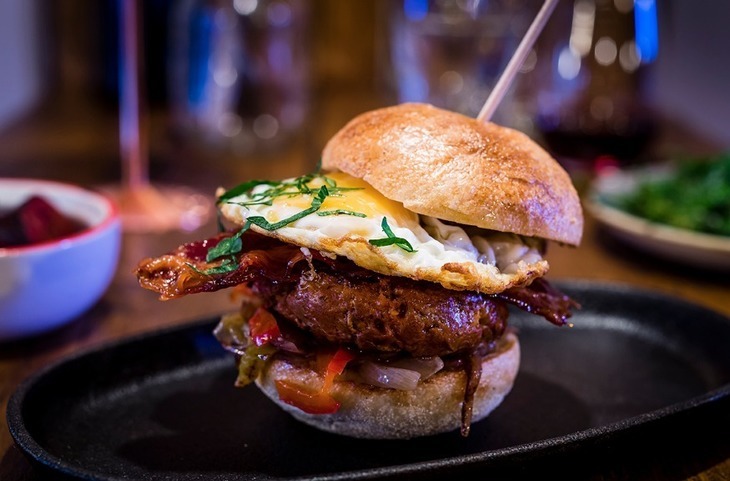 High on your hit list should be José Tapas Bar, an always-busy joint that fires out small plates of delicious tapas to a tiny, 16 stool bar crammed with punters hungry for a portion of gambas al ajillo. 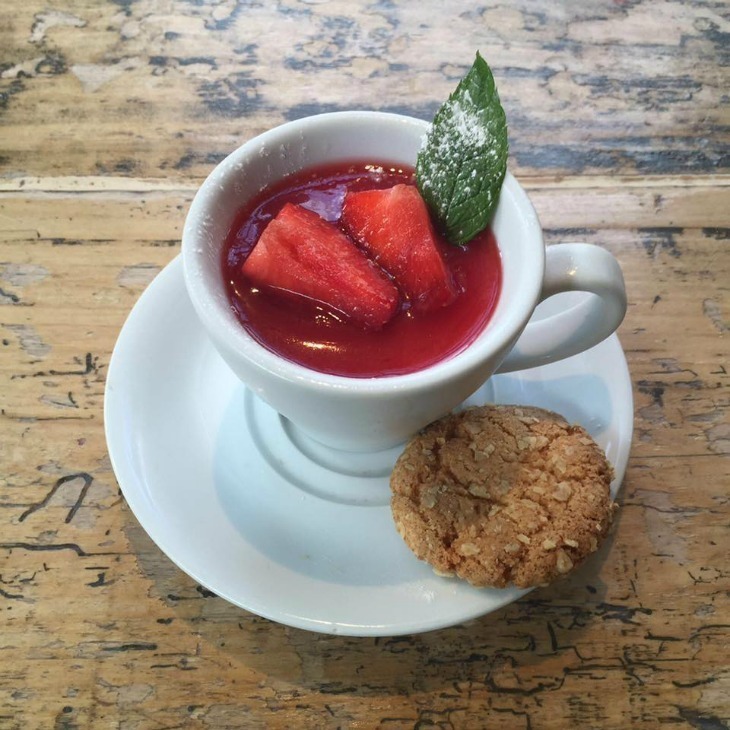 Foods of other nations are well-represented, with good-value Indian curries at Silka's Southwark basement, great Italian pasta and fish dishes at Giuseppe's Place and Turkish mezze at the Borough High Street branch of the Tas restaurant chain. For some of the best pasta in London, try Padella, although be prepared to queue (see our full review here). 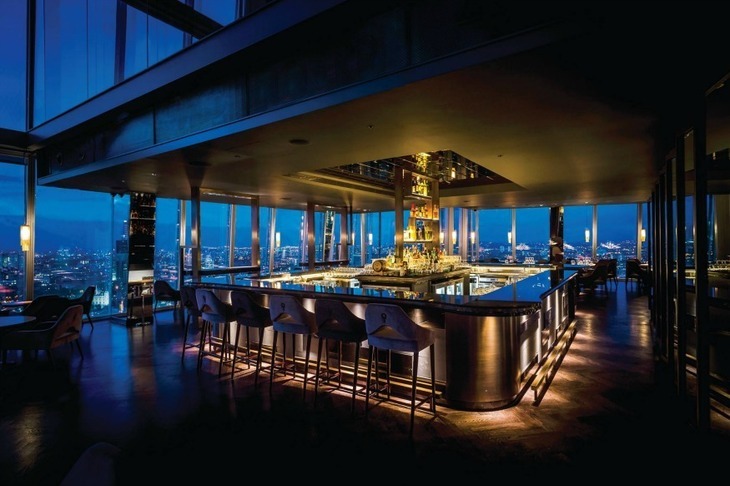 The slickest, shiniest restaurants in the London Bridge area are housed in The Shard. Towering over London and with prices to match, Aqua Shard offers modern British food on level 31, and Hutong does dim sum lunches and a sprawling cross-China a la carte menu (level 33). Head to Oblix bar (sandwiched between the two restaurants at level 32) for pre-dinner aperitivi or post-dinner nightcaps. The interior at Aqua Shard. There aren’t a huge number of post-midnight places in the area, but Nine Lives underground speakeasy (formerly called Cecil's) is open till an indeterminate 'late', with cocktails, live music nights and after-dark dancing. The Hide Bar on Bermondsey Street, meanwhile, clocks out at 2am on Friday and Saturday nights. This cocktail bar celebrates home-grown boozing with almost all their drinks distilled, fermented, produced or brewed in the capital itself. We'll toast to that.